In the beginning were Siegel and Shuster. And from the minds of these two men sprang a Superman, immortal and unchanging, towering across the newsprint like a beacon of continuity, a standard of all who came after to follow, a monument to consistency for 70 years. You think so, do you. Actually, since 1938, Superman has undergone many changes, some slight, some just enhancements, but many of such major proportions as to justify the contention that an entirely new character had been created. This fact has been given some slight acknowledgment by DC Comics over the years, primarily in the development of the Earth 1/Earth 2 theory. It is surmised that the original Siegel and Shuster version of Superman lives on a parallel Earth and has a slightly different set of powers from the version with which we are currently familiar. This Earth 2 Superman supposedly is the one who appeared in DC Comics during the 1940s. Actually, the Earth 2 Superman is a convenient modern construct who differs as significantly from the 1940s version of Superman as he does from the present day one. 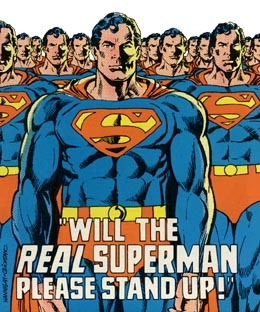 Throughout the years, the powers-that-be have seen fit to redefine Superman's powers and origins several times in order to keep the character current with popular tastes. Sometimes these changes have been clear cut. More often, they have evolved following a period of contradictions. By ignoring some of the contradictions and treating certain periods in Superman's career as overlapping, it becomes clear that there is approximately one substantially different version of the Man of Steel for each decade of his existence. On to the Creaton of Superman!